Car suspension is not only about how smooth your car rides but is essential for stopping, turning and control of the vehicle in general. So, maintenance of car suspension is as equal as other fixes like engine oil changes or brakes. Most people take car suspension lightly and get it repaired only after it gets terrible says mechanics at http://www.westcoastsuspension.com.au/. Experts at www.autocar.co.uk say that it is not easy to recognize if the suspension has gone wrong or not. If your car is driving smoothly and you are not noticing any vibration that means the suspension is working. Alignment and Suspension: Car alignment and suspension go together. Shock absorbers which help to absorb the shocks can affect your car tires. If the alignment is not proper, the mobility of your car while turning or stopping is changed. Moreover, tire alignment can get affected by hitting a pothole or a bump and so it is essential to get it checked every time you feel you hit a road bump or any other bump or if you fit new car tires. There is another way to find if the alignment is not correct. If your car is swerving on a straight road and you need to control the steering, then it is a sign that the alignment is disturbed and hence the chances of suspension weakening are high. The drive is not smooth: If you feel your car is not driving as smoothly as before, you should get your suspension checked. Shock absorbers are needed to absorb the shocks when you are riding on a bump or an uneven road. Sometimes one of the shocks is worn out due to which one side of the car is bouncier and hence loses balance. You can also feel that it is harder to control the vehicle while turning the corner, all these are symptoms which needs a fix of suspension. A check on the suspension will tell you whether you need replacement of shocks. Nosediving when stopping: Shock absorbers can be worn out for various reasons like wear and tear or due to poor quality. When they are worn out, you feel like the car is lunging and nose diving when you apply brakes to stop the vehicle or when you suddenly apply brakes suddenly. That can lead to car accidents, as you are unable to use brakes and stop the car. Tilting when parked: Due to wear and tear of shocks, the area around it sags and hence can lead to one side. So, if you feel that the car is slanted when parked do not ignore it as it can be because of the shocks. 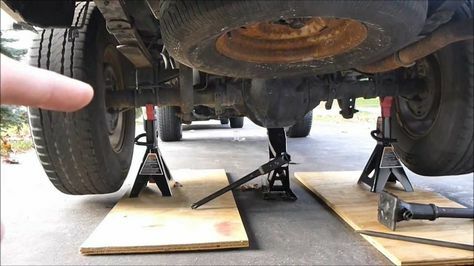 There can be other issues that can affect the car like it's lousy alignment or other mechanical snags. It is advisable to get your vehicle inspected by a mechanic if you feel your vehicle is slanted.